Today was a snow day, theoretically. There was the threat of snow, which kept Joey and the girls home. I made great messes in the kitchen with not much to show for it, Joey made tiny valentines, and the girls held on to us both. It seemed that there was a rope linking them to us, and it never got longer than about six feet. There is an old story that you might have heard, a section of Plato’s Symposium that describes why two lovers always want to join together. According to the story, we were once double the people we are now. A punishment from the gods split us in two, and we are forever trying to rejoin our other half. It makes sense, don’t you think? The story has started to strike me differently lately Yes, there is a powerful drive to forget the boundaries of your body when you find another person who feels like they could be the lost half. Anyone who has been sixteen is familiar with that. But this is all based on a story, a philosophical creation myth of love, if you will. How about in that circumstance when two bodies really are connected, like in pregnancy? Although there are, of course, many differences between these two situations, I cannot but help to notice that my sometimes my children seem to be trying to, well, how do I put it? They are trying to get back in. On days like today, when they are just attached, to watch them, one would think that I have a magnet inside of me. To be quite honest, this drives me absolutely batty. If there is one thing I miss about that long ago and far away before I was a parent, it is my physical space. I am a woman with a fairly large bubble around me. Being a human jungle gym doesn’t suit me, and when the kids are under my feet in the kitchen because “I just want to be with you, Mama,” I do not do the right thing and sit down on the floor and take them in my arms. I nursed and co-slept for many years, carrying my children around in slings and soft carriers. But when they hopped down and ran away, I stretched my arms and cheered. Today I started thinking about that myth of the double person, trying to understand their physical need to touch me at all times through that lens. And I understand what they’re trying to do, just a little. After all, I have been known to hold on to them too long when they are running off to school, to breathe in their hair when I am reading a book. I know what that feeling is too. By the time dinner rolled around, I was feeling a little less annoyed. It was finally snowing, and Rosie was vacuuming the living room, pulling the vacuum around behind her. I wanted to scoop her up, but I let her go about her business, because who can interrupt a child from vacuuming the living room, really? There were no tears at dinner, and we talked about Rosie’s birthday coming up. I ate slowly, an absolutely rarity these days, and I had three helpings of cabbage and potato gratin with sage. This was my favorite cabbage week dish yet. I loved it. 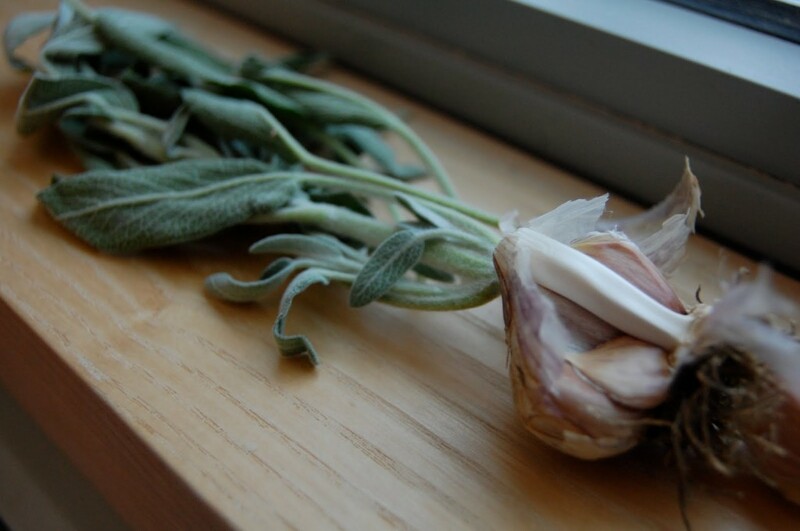 I think it was too sage-y for Joey, and Sadie couldn’t eat it because of her egg allergy. Rosie wouldn’t touch it because it contained a vegetable, so in the end, it was mine. If I have to share my body and my space all day, at least I get my gratin to myself. Preheat the oven to 350 degrees. 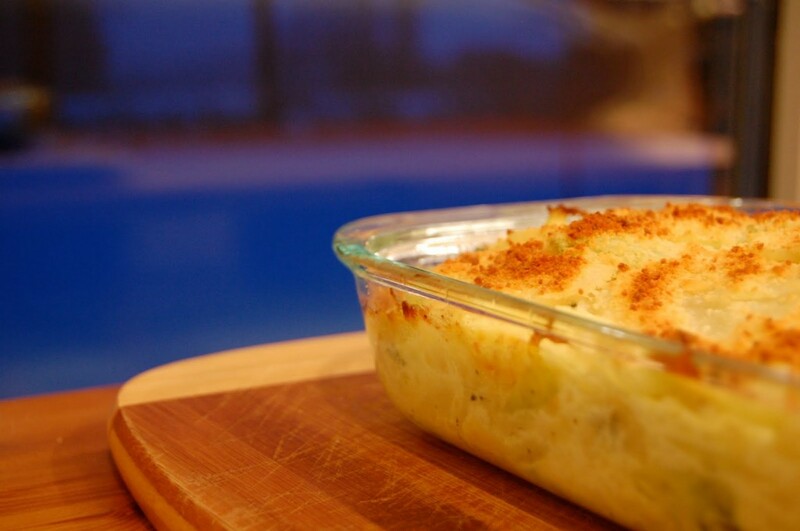 Lightly butter an 8×12 gratin or baking dish. Bring a gallon of water to boil. Add one tablespoon of salt to the water, and add the potatoes. Cook until nearly tender, about 6 minutes, and remove with a slotted spoon, keeping the water boiling on the stove. Put the potatoes into a colander and set aside. 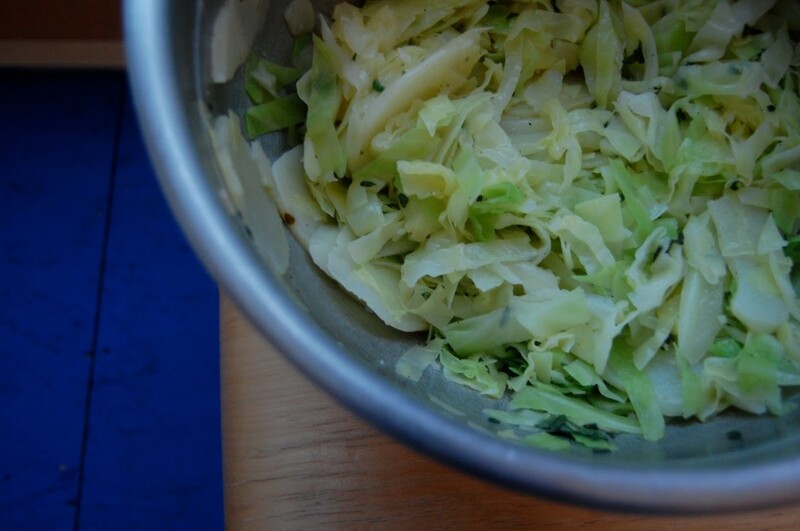 Put the cabbage into the water, and cook for 5 minutes. Don’t worry if the water doesn’t return to a boil. Transfer the potatoes to a large bowl, and drain the cabbage in the colander, rinsing under cool water. 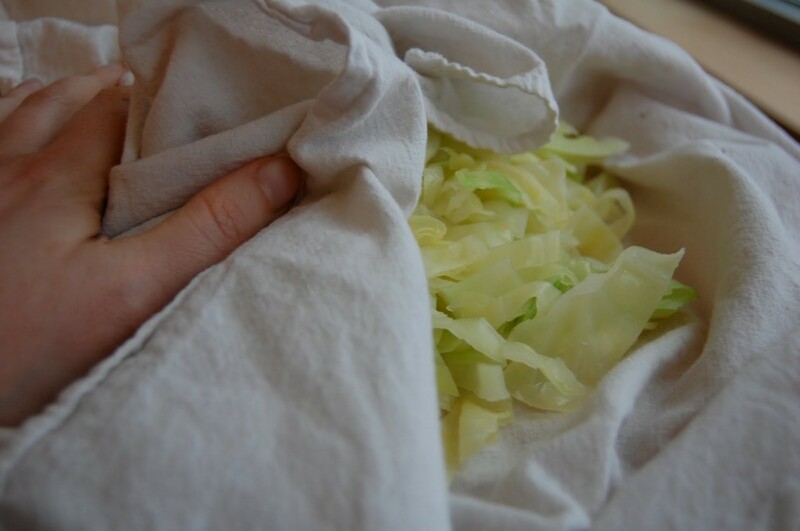 Wrap the cabbage in a kitchen towel to absorb excess water, giving it a few twists. Put the cabbage in the bowl with the potatoes. Melt the butter in a small skillet with the garlic and sage. Cook for about 1 minute, not letting the garlic brown. Pour it over the cabbage and potatoes. Toss well, taste, and season with salt and pepper. Transfer to the prepared baking dish. Whisk the milk, eggs, flour and parmesan together, reserving a bit of parmesan for the top. Pour the mixture over the potatoes and cabbage and top with the bit of parmesan. Bake until firm and lightly browned, about 50 minutes. Let cool for at least 10 minutes before serving.